605 pages | 201 B/W Illus. Puzzles, Paradoxes, and Problem Solving: An Introduction to Mathematical Thinking uses puzzles and paradoxes to introduce basic principles of mathematical thought. The text is designed for students in liberal arts mathematics courses. Decision-making situations that progress from recreational problems to important contemporary applications develop the critical-thinking skills of non-science and non-technical majors. The logical underpinnings of this textbook were developed and refined throughout many years of classroom feedback and in response to commentary from presentations at national conferences. The text’s five units focus on graphs, logic, probability, voting, and cryptography. The authors also cover related areas, such as operations research, game theory, number theory, combinatorics, statistics, and circuit design. The text uses a core set of common representations, strategies, and algorithms to analyze diverse games, puzzles, and applications. This unified treatment logically connects the topics with a recurring set of solution approaches. Requiring no mathematical prerequisites, this book helps students explore creative mathematical thinking and enhance their own critical-thinking skills. Students will acquire quantitative literacy and appreciation of mathematics through the text’s unified approach and wide range of interesting applications. "… an interesting approach to the world of mathematics. … The layout is good, as is the coverage. … The reinforcing exercises are excellent. Using logic and other techniques, the text lays out methods to help students learn to think in a mathematical manner. Summing up: Recommended. General readers, lower- and upper-division undergraduates." Marilyn A. Reba is a senior lecturer and Douglas R. Shier is a professor emeritus, both in the Department of Mathematical Sciences at Clemson University. The logical underpinnings of this textbook were developed and refined throughout many years of classroom feedback and in response to commentary from presentations at national conferences. 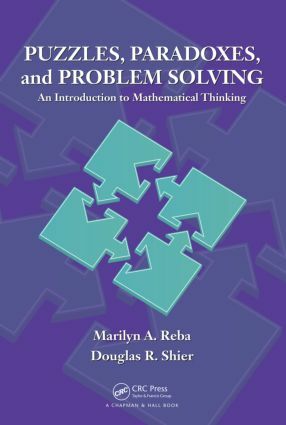 Selected material from this book is currently being used in the Department of Mathematical Sciences’ liberal arts mathematics course and in a problem-solving course in the Honors College.